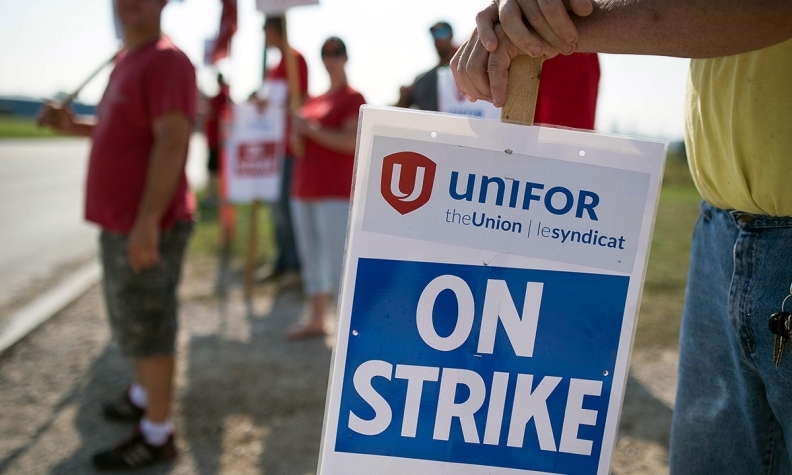 Unifor’s strike at the Chevrolet Equinox assembly plant in Ingersoll, Ont., put a dent in overall Canadian factory motor vehicle sales during the month of September. The strike began Sept. 17 and factory sales of finished vehicles fell by 5.9 per cent to $4.96 billion that month compared with the month before, according to numbers released by Statistics Canada on Thursday. When compared with September 2016, sales were down 10.8 per cent. The agency numbers always lag by a month. The strike cost the GM production of 20,000 Chevrolet Equinox crossovers over four weeks company CFO Chuck Stevens revealed in a third-quarter earnings call in October. Motor vehicle parts sales were down 2.5 per cent in September. The strike lasted four weeks. The two sides agreed to the terms of a new deal Oct. 13 and the union ratified it and went back to work Oct. 16. The strike in Ingersoll and a scheduled four-week shutdown that started Oct. 2 at FCA’s Windsor assembly plant, where retooling took place to ensure Dodge Grand Caravans will meet new U.S. safety standards, will likely affect October numbers. “There will likely be a further small decline, likely in the 1-1.5 per cent range in October in vehicle production, but parts shipments will start to increase due to higher vehicle assemblies in the U.S.,” Gomez said. Statistics Canada said Thursday that manufacturing sales climbed 0.5 per cent, lifted by a 10.3 per cent jump in petroleum and coal. Overall Canadian factory sales climbed for a second month in September, a surprise lift to an economy that was supposed to be losing steam in the second half of the year. Factory sales in volume terms posted a 0.7 per cent gain. The overall gain in factory sales was narrow, with just seven of 21 subsectors reporting gains. The latest report suggests factories are regaining momentum after declines in June and July. Manufacturing still faces risks from a higher Canadian dollar that can curb foreign demand and changes to the North American Free Trade Agreement that could curb access to the U.S., Canada's biggest customer.